Black licorice candy is chewy and has a semi-firm consistency. It is flavored with licorice root extract that comes from the licorice plant. American licorice is a native, perennial legume that grows in temperate climates of North America, according to the United States Department of Agriculture. Licorice, which also grows in Europe and Asia, is the root of varieties of the Glycyrrhiza plant. The sweet flavor from Glycyrrhizin, a Greek word that means "sweet root," has been extracted and used since ancient times for candy, teas, lozenges and medicines. Different brands of licorice use different sweeteners in addition to the sweet licorice extract. The most natural black licorice candy adds only molasses as a sweetener; some organic licorice candies contain organic sugar, organic molasses and corn syrup. Other sweeteners used in licorice recipes include glucose syrups and dextrose. According to research scientist, Perry Romanowski, in an article on the How Products Are Made website, sweeteners comprise about 60 percent of the licorice paste that is eventually formed into black licorice sticks and other shaped candy. Some licorice manufacturers use wheat flour to bind together all the ingredients in licorice. Wheat flour is composed of starch and protein. When it is combined with water, it creates gluten, a malleable paste that won't break when it is stretched and rolled. Because of the wheat flour, licorice paste can be extruded into a variety of shapes and sizes. Some manufacturers have found ways to create wheat- and gluten-free black licorice. One way to do this is to use organic rice flour and organic rice starch. Soy lecithin is used as an emulsifier to keep ingredients together in licorice products. To give black licorice candy its unique flavor, licorice extract, anise and aniseed oils are included. Liquid caramel may also be used for flavoring. Salt is another ingredient in black licorice. Black licorice extract, caramel coloring and cocoa powder are used to give licorice its dark black color. Sunflower oil and coconut oil are used by some licorice makers. Salty licorice, also called salmiakki, is a variety of black licorice made with ammonium chloride combined with the usual ingredients, according to The Food Museum Online Exhibit. Salty licorice is popular in Sweden, Finland, Norway, Denmark, the Netherlands and Northern Germany. Despite its high concentration of sugar, licorice is still susceptible to microbial contamination, which is why potassium sorbate is used as a preservative for some licorice recipes. 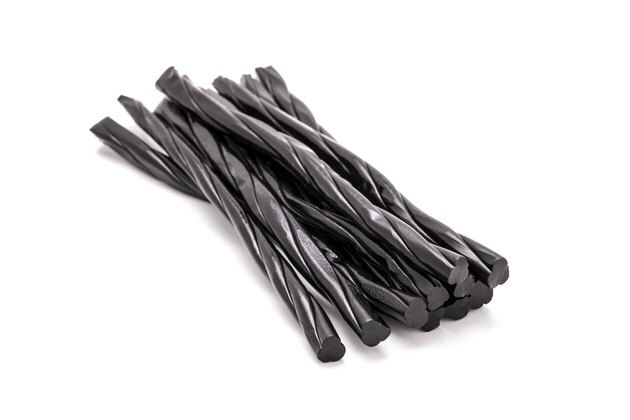 The shiny surface of some black licorice candy comes from beeswax and carnauba wax. Gelatin and gum Arabic are used as binders and for texture. Because gelatin is made from animal keratin, vegetarians and vegans do not eat products made with it, but gum Arabic is derived from plants and has no animal products. What Ingredients Are in Mentos?